Did you hear about the new My Life As Dolls Food Truck? The Food Truck by My Life As is brand new and very exciting. They are out, and ready to come home with you. You can order your very own My Life As Dolls Food Truck exclusively at Walmart. In a Hurry? Click HERE to Order Food Truck by My Life As Dolls. Don’t wait too long to order this exciting addition to the My Life As dolls collection. My Life Doll stuff has exploded in most households that have girls ages 8 to 12 years of age. They are larger dolls, 18 inches tall, and come with tons of My Life Doll Clothes from Walmart. The My Life Doll accessories are amazing. 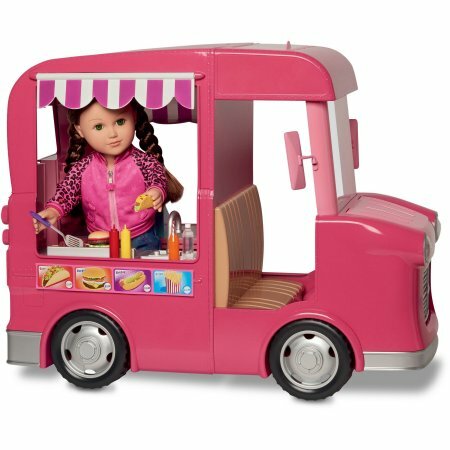 The My Life As Dolls Food Truck is just one of many exciting accessories you can find for your girls to play with their dolls. 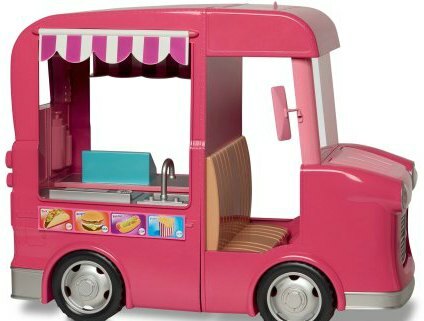 The food truck toy has so many accessories and moving parts, that it becomes a great interactive toy for boys and girls. My Life As Dolls Food Truck Is Bigger Than it Looks! The My Life Dolls are 18 inches tall, so you know that the My Life As Dolls Food Truck has to be that and more. Although, this cheats just a bit because the food truck expands to make room for the My Life Doll. 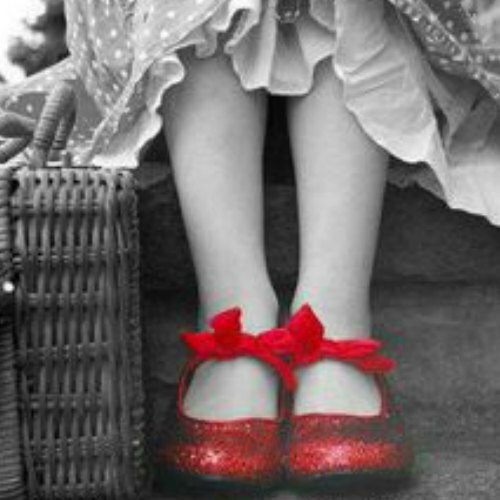 The exact dimensions are:12.87 inches tall, 26.75 inches long, and 21.37 inches wide. So you can see that it is a larger toy item and perfect for older kids to play with. The My Life Dolls can go inside and pretend to be running a food truck business. 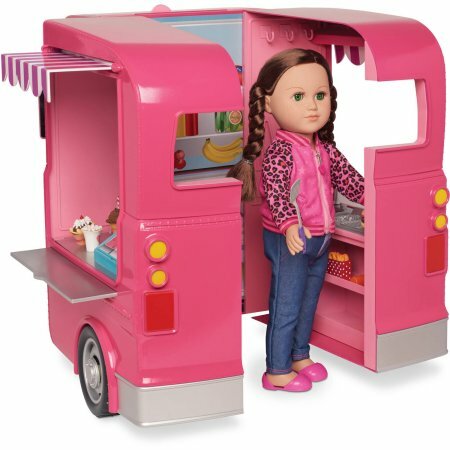 It comes with over 40 accessories and you can use any My Life Doll that you like, they will all fit in this new My Life Food Truck. Check out this great video review of the new My Life As Dolls Food Truck! Besides the new My Life Food Truck coming with the truck, it comes with plenty of food and cooking utensils to make and deliver food. 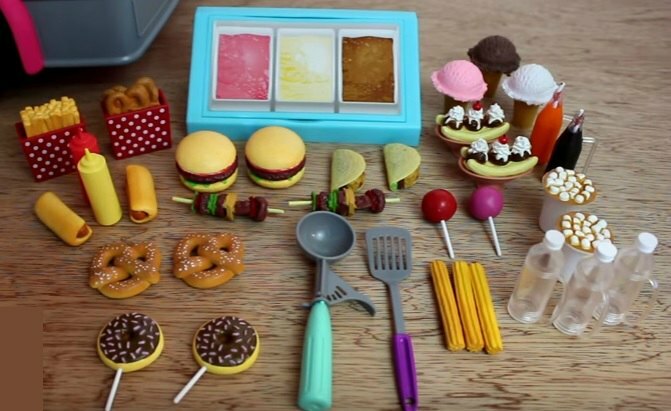 Here are a few: yummy suckers, pretzels, hot dogs, tacos, hamburgers, french fries/onion ring combos, cola bottle, orange soda bottle, hot cocoa cups, water bottles with handles so the dolls can hold them, BBQ skewers, ketchup bottle, mustard bottle, cooking spatula, ice cream scooper, banana splits in bowls, donut sticks, ice cream scoops, ice cream cones, churros, a sticker sheet with pictures of the food you can buy, a money sheet, an ice cream container and a piece of chalk for the chalkboard. It has features that make it look like a real food truck, including a grill and sink. When you slide both sides out to make it larger, you get a coffee bar on one side and soda machine on the other. Don’t worry, all these stickers are included with the truck. 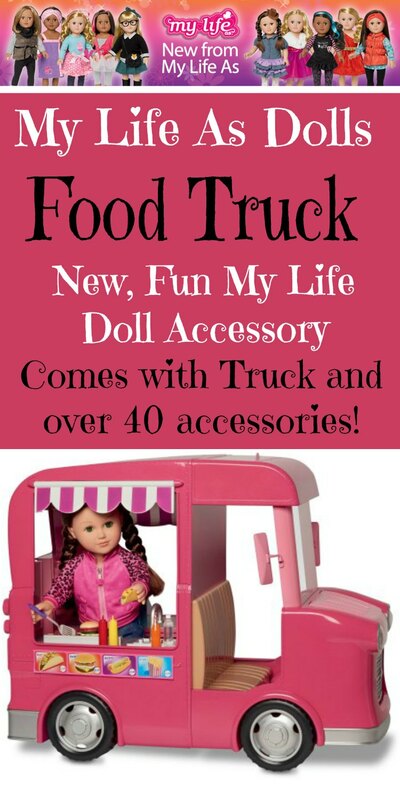 What little girl wouldn’t be excited about getting her very own My Life As Dolls Food Truck? 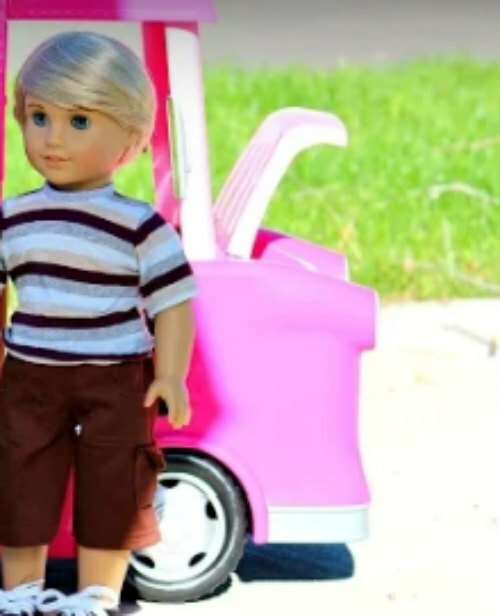 You don’t need to be a fan of the big dolls to enjoy this exciting food truck toy. With all the accessories, there are hours of fun just playing with this food truck itself. In the front of the Food Truck there is a storage compartment. If you look inside, it looks like its full of ice and water bottles. But you can use it for storage or anything you want. I love how much detail they put into this great food truck toy. Besides the front of the truck storage, there are storage shelves inside the food truck. They have thought of everything! Any of these dolls will fit in the new My Life As Dolls Food Truck.